Our semester at ULM began a few weeks ago, and the schedule for this fall promises to be busy but also engaging and fun. Here are a few highlights of what’s to come in the weeks and months ahead. Guest Artists: We will be hosting two horn guest artists for performances and master classes this semester: The Allumer Quartet, and Dr. Heather Thayer, Horn Instructor at Ouachita Baptist University. The Allumer Quartet is a horn quartet based in Baton Rouge, consisting of current graduate students and graduates from LSU. The members are Centria Brown, Tom Fish, Evan McAleer, and Kyle Peterson. “Allumer” is Cajun French and means “to light” or “ignite.” Their program on September 5th will include works by Alexander Mitushin, Eugène Bozza, and Béla Bartók, as well as the world premiere of two new works by Marc Mellits and Guy Mintus. *I got to hear a bit of their rehearsal in our hall today, and they sound great! Orchestral Concerts: Two big pieces on my bucket list are coming up this fall in the Monroe Symphony Orchestra, Beethoven’s Symphony No. 7 and Rachmaninoff’s Piano Concerto No. 2. Of course, these works need no introduction, and I’m really looking forward to playing 1st horn on them. Although the concert isn’t until the end of October, I’ve already begun training for these demanding parts. 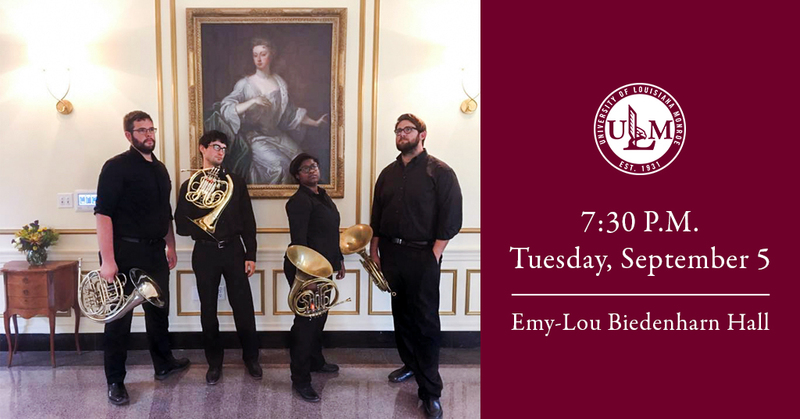 Brass Trio Recital: To close out the semester, Black Bayou Brass will perform two full concerts in November and December. On November 29th we’ll be giving our annual faculty recital, in preparation for a future recording project in January 2018. This project has been a long time coming, and will feature lots of great new music for trumpet, horn, and trombone, including two works which we recently commissioned. On December 15th we’ll be giving a holiday concert for brass and organ at Grace Episcopal Church in Monroe. Though we typically present a holiday concert every December, this one will be quite special as all of the proceeds will be donated to a local animal shelter. Watch for more info as we get closer to the concert date.